These empanadas are like an evening in autumn – the leaves are all golden, red, and orange, and the smoke from somebody’s fireplace fills the air. Made with yellow corn, red beans, roasted butternut squash, and smoky paprika and chipotle puree, they’re pretty and delicious. They go well with artichoke heart salsa, which brings coolness to their smoky warmth. I baked mine, but you could fry them if you wanted. Mix the flours, salt and pepper. Grate in the frozen butter. Mix lightly with your fingers until it’s crumby. Add 1/2 to 1 cup ice water until you can pull it altogether into a ball. Knead very lightly until it’s smooth, then wrap it in foil or plastic and put it in the fridge till you need it. Mix the butternut squash chunks with sage, shallot, and enough olive oil to coat everything lightly and roast in a 425 degree oven till the squash starts to brown and caramelize. 45 minutes or an hour – but keep an eye on it! In a large frying pan over medium heat, warm the olive oil. Add the garlic, and stir to fry for a minute. Add the red beans, paprkia and oregano, stir to coat everything. Stir in as much chipotle as you like. I use about 1 teaspoon, but I have little boys, so I never make anything too hot. Taste a bean or two after you’ve stirred in one teaspoon, and then decide if you need more. Stir in the corn. Mix everything up and stir till it’s all hot through. Put it in a big bowl with the roasted squash, the cilantro, the cheese, and plenty of salt and pepper. Squeeze half a lime into the mix, and mix it all up. Break off a plum-sized amount and roll it into a rough circle about 6′ across. Place about half a cup of filling just off center. As you can see, I’m not terribly concerned about getting it very round. 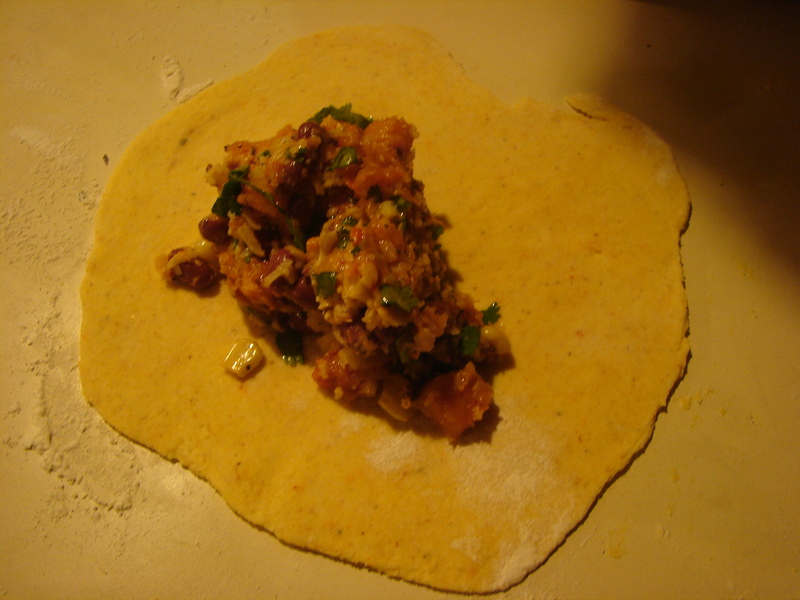 Fold the dough over to cover the filling and then roll up the edges, folding the bottom over the top about 1/2 inch, and pressing gently to seal them. Use a fork to make them pretty and secure, and poke the empanada in 2 places to let out steam. Bake at 425 for 20 minutes to half an hour, till the top starts to get golden brown and crispy. Serve with salsa or guacamole. 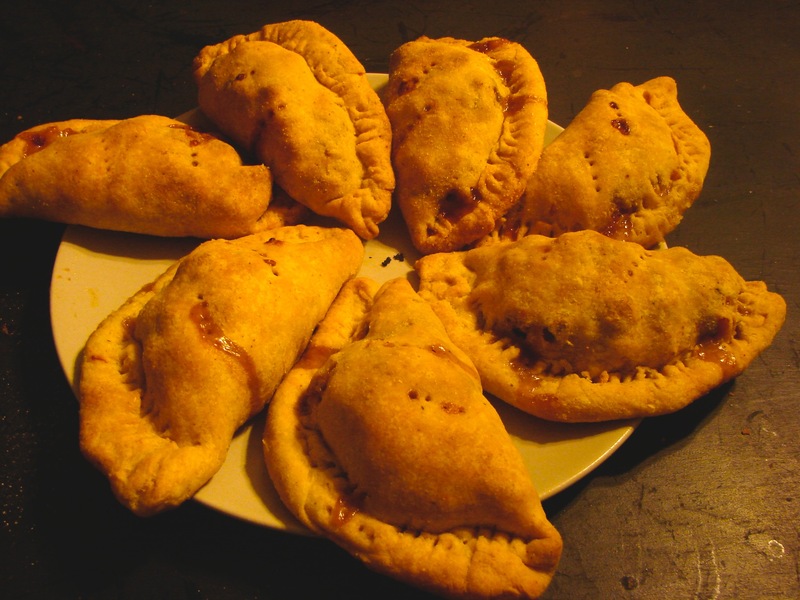 This entry was posted in beans, crust, pie, recipe and tagged chipotle, cornmeal crust, cornmeal empanada, red bean empanada by Claire. Bookmark the permalink. This is an amazing recipe! I’m making them again tonight for some vegetarian friends. Thank you for sharing. I’m glad the recipe worked for you! Thanks for letting me know. How would you go about reheating these?